Omega-3, omega-6, omega-7…omega-9! 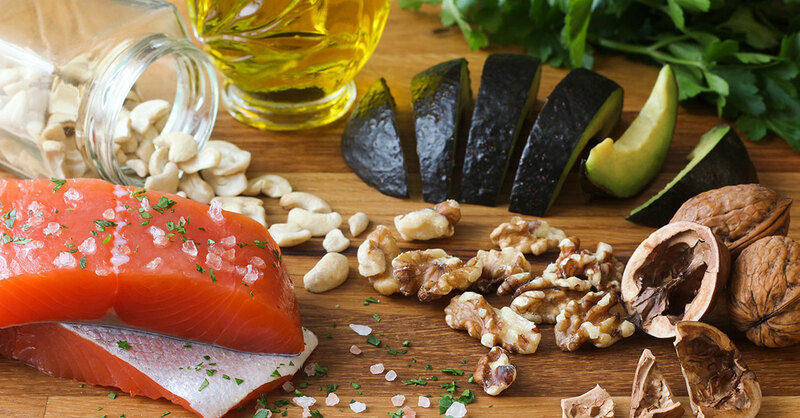 It seems you need an advanced degree to keep these healthy fats straight so you can be healthy. But we’re going to sort it all out for you in short order. First, the numbers simply refer to differences in chemical structure of the healthy fats. Most important is that omega-3 and omega-6 fats are considered essential polyunsaturated fatty acids, so named because your body can’t make key ones—the omega-3 alpha-linolenic acid (ALA) and the omega-6 linoleic acid (LA). You need to get them through diet and/or supplementation. Omega-7 and omega-9 fats are called nonessential, but that’s not because you don’t need them—it’s because your body can make them on its own. Omega-3s, for example, which also include eicosapentaenoic acid (EPA) and docosahexaenoic acid (DHA), are vital for the health of your cells and the sheaths around nerves. They help improve circulation and oxygen uptake, protect your heart, and may reduce blood pressure slightly. While omega-3s seem to get all the attention for heart health, the others also play important roles. Omega-6s, which include arachidonic acid (AA) as well as LA, also have disease-fighting powers. A surprising finding: A Finnish study that followed participants for about 22 years found that having higher blood levels of LA and, to a lesser extent, AA helped prevent premature death from heart disease. These levels stemmed from foods in the diet, such as vegetable oils, and not supplements. Linoleic acid also has been shown to improve glucose metabolism, which helps prevent diabetes, and prevent fat accumulation in the liver, reducing the risk of fatty liver disease, said the study’s lead author, Jyrki K. Virtanen, PhD. Omega-7s (primarily palmitoleic acid) and omega-9s (primarily oleic acid) reduce inflammation and are important for metabolism, so they may help you control your weight. Omega-9s may also help reduce your risk for developing cardiovascular disease and stroke. Omega-3s. Fatty coldwater fish, such as salmon, mackerel, lake trout, sardines and herring, are excellent sources of EPA and DHA, the most important of the omega-3s—you can get all you need in two 3.5-ounce servings a week. Plant sources, notably flaxseed (eaten ground to extract the nutrients), chia and hemp seeds, walnuts, soybeans and Mung beans, provide ALA, among other nutrients. The body can convert ALA into EPA and DHA, but not very efficiently, so unless you’re a vegetarian, Dr. Virtanen suggests getting your fix with fish. Omega-6s. These are found primarily in plant-based foods. The best sources are vegetable oils such as sunflower, safflower, soybean, corn and canola…and seeds, nuts and nut butters. Most major sources of omega-6 fatty acids also contain some omega-3 fatty acids, so that’s also a good reason for consuming them, Dr. Virtanen said. You can get enough omega 6s in your diet simply by eating a small handful of mixed nuts and seeds—aim for a wide variety of both—or two tablespoons of nut butter or by using a tablespoon of vegetable oil in cooking or in salad dressings each day. When it comes to nuts and seeds, eat them raw, not roasted, since high heat can destroy beneficial fatty acids. Dr. Virtanen also suggests eating nuts and seeds in their natural state—with no added salt or sugar. Keep in mind that quality and quantity—meaning not too much—are important when it comes to omega 6s. That’s because in the typical American diet, an overload of omega-6s from too much fried and processed foods made with even healthy oils is partly to blame for our obesity epidemic, particularly when our omega-6 intake far outweighs our intake of omega-3 foods, which it typically does. Omega-7s and omega-9s are fats that your body can make itself—there are no recommended daily requirements—but research has made us more aware of their value, with the sea buckthorn berry and its oil, rich in omega-7s and a wide range of antioxidants, having the potential to be a superfood. There’s also some omega-7 in macadamia nuts, meat, dairy and fatty fish. Canola oil and avocados are good “9” sources, and olive oil is even richer. Little-known fact: Some olive oil has almost all the omegas (vegetable oils don’t contain EPA and DHA)…but amounts of each differ greatly based on factors such as where the olives were grown and how they were pressed. What about supplements? Once the heart-health benefits of omega-3 fatty acids in particular became known, taking fish oil pills became the rage. But there’s mounting evidence that you do not get the same benefits from taking these capsules as from eating omega-3 rich food. What’s more, in producing omega-3 capsules from fish oil, the oil’s omega-7s are removed, so you’re not getting their benefits at all. Since science still doesn’t know all the other nutrients in foods that might be contributing to their benefits, to protect your cardiovascular system, get your omegas from food.